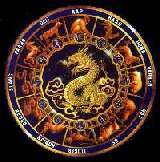 Catharina's Astrology Pages, Chinese Zodiac: what's your sign? !! This form only works correctly if you're born after February 20 !! If this isn't the case, you'll have to look in the Chinese zodiac table.